The romance of France has captured people’s imaginations for 100’s of years. 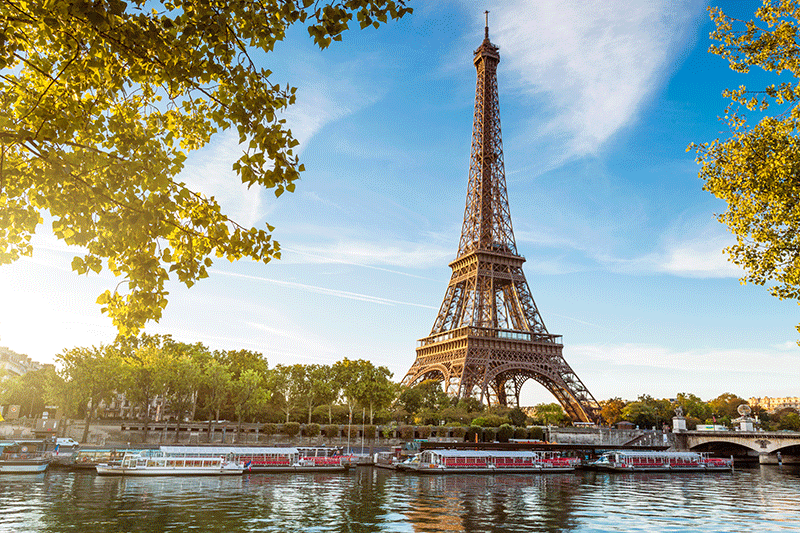 What could be more romantic than sipping champagne at the top of the Eiffel Tower, cruising the river Seine or cycling through the South of France or for the more energetic up the French Alps. A holiday in France will appeal to travellers interested not only in its rich history and culture, but France’s ski resorts, beach resorts, vineyards and quaint country towns provide visitors with endless opportunities for adventure and exploring plus its heaven for “foodies”. The best time to visit France depends on which activities you’d like to partake in. Wintertime ( December to March), although cold, brings with it opportunities to ski in the alps while the Spring and Summer times ( April – September ) brings with it warmer weather for those looking to enjoy the outdoors. Summer season, however, can get very busy, so that is something to bear in mind when planning your holidays. Spend a day at Disneyland Paris with the kids. The south of France has a warm Mediterranean climate with hot summers and mild winters. Rainfall occurs throughout the year in this region and snow falls in the winter time. The northern region of France, which includes Paris, has a temperate climate with the summers being warms and the winters cold. Rain falls throughout the year. The western coast, from the Loire valley to the Pyrenees, offers a milder climate. However, daytime temperatures can be very high in the summer while the mountainous areas are colder and get heavy snowfall in winter. South African citizens must have a passport that is valid for three months after their intended stay, and a valid Schengen visa, to enter France. Temporary passport holders will not be granted a visa. Letter from Employer confirming leave has been granted and that you will be returning to your current position. No specific vaccinations are compulsory for entry into France. French hospitals and health facilities are top class. Doctors and hospitals often expect immediate cash payment for health services. Medical insurance is strongly advised and compulsory if travelling on a South African Passport. The threat of terrorism is very high and attacks are indiscriminate. Visitors are asked to be vigilant in public areas. Thieves and pickpockets often operate on the metro and around airports. Theft out of cars is common and tourists are advised to conceal bags and purses when driving and to never leave valuables unattended in the car. Bag snatching is also common, particularly on public transport and in shopping centres. It is appreciated by the locals if visitors attempt to speak a few words of French during conversations. Smoking in public places is not allowed and hefty fines are imposed on offenders. Service in restaurants is generally slow and they automatically add 15% service charge to the bills so no tipping is required. Titles are necessary and the person being addressed should be referred to as ‘Monsieur’ (Mr.), ‘madame’ (Mrs.), or ‘mademoiselle’ (Ms.). Taxi drivers and hairdressers should be tipped approximately 10% of the total charge. A reasonable estimate for tipping hotels staff is generally €1.50 a day and tips of about €1 are given to tour bus drivers, guides and museum tour guides. Getting to France is easy as there are many direct flights to France from all major cities in the world. France has an extensive network of regional airports of which are served by many airlines from other parts of Europe. Domestic air travel is relatively expensive except on some high-volume routes where the airlines compete with the trains. There are numerous car rental kiosks to be found at airports around the country. Many of the smaller towns do not have a train station close by so driving allows you convenient access and a lot more flexibility when travelling. If you can rather avoid driving in or around Paris as the traffic congestion is terrible. There is no national bus route in France. You can travel regionally by bus in France but is not possible to travel domestically on a bus in France. Companies like Eurolines offer international bus routes that go through France to other countries. The best and fastest way to travel through France is by rail. Most towns are well connected and high-speed train networks (called the TGV, or Train à Grande Vitesse) easily connect to regional and local trains. France is incredibly accessible for those who don’t want to drive. The Euro (EUR) is the official currency in France. Money can be exchanged at banks, foreign exchange outlets and some large hotels, although their rates are generally not as good. All major credit cards are accepted. The international access code for France is +33. Free wifi is available in most hotels, cafes, and restaurants.